Let this gorgeous Lady take you out to sea. 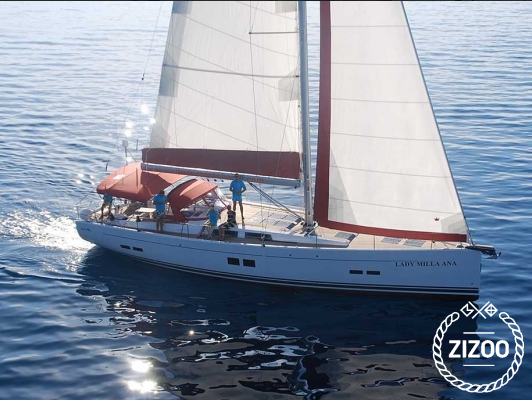 The Lady Mila Ana is a 2013 Hanse 575, built for those who like the finer things in life. With 4 spacious cabins sleeping a total of 8, plus a cabin for the skipper as well, you can rest assured that this elegant boat will take you on a carefree 5 star holiday sail. The gorgeous salon is spacious and inviting and the kitchen area is plentiful to prepare a light snack or a full hot meal. Serve up some wine on deck while anchored at your own personal bay. Let the kids bellyflop into the sea, and feel the splash as it cools your sun-kissed skin. For an extra charge you can relish in VIP treatment which includes a Nespresso coffee machine, Wi-Fi, a welcome package and a whole lot more. Book The Lady Mila Ana today and set sail with the help and guidance of your experienced and professional crew. Mega schönes Boot mit einer hammer Küche! Hatte total viel spaß mit meinen Freunden und würde das Boot glatt noch mal buchen! Wir haben es nicht bereut. Genau das richtige Boot für uns. Perfekt!